Description: NS PL97 at Henderson street. 15:26 hrs. Description: 17th Ave., 1134 hours. Description: 68Q pulls off the siding and heads east. Description: With a fresh crew, NS 68Q heads east through Berea, with NS 7701 leading. Moments later, CSX Q364 would pass with CSX 7701 leading. 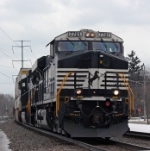 Description: NS 205 at CP 195 in Olmsted Falls, OH. Description: Power in Enola Yard. A Providence & Worcester B39-8 is in the background. Description: 15T powers west through Sinking Spring at 1823. Description: TRICK OR TREAT: Ns 21E lugs its power around the corner with a rent-a-wreck and a ex LMS in consist.